Millennials, people between the ages of 15 and 34, make up nearly half of the current vegan population. Despite being dealt a bad deal by prior generations, this generation is increasingly able to see past all the ways our society indoctrinates us to use nonhuman animals. 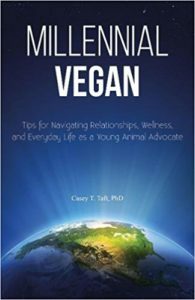 Millennial Vegan offers support to this important group by providing tips for advocacy, strategies for communicating with unsupportive peers, dealing with bullying and managing anger, advice on issues related to dating, and information on maintaining personal well-being. The movement for nonhuman animals depends on the support of millennials, and this guide will help this already aware group maximize their ability to be the best vegan advocates they can be. This is such a necessary book. We live in a very nonvegan world so knowing how to navigate that world is critical. There are many aspects of this text I really appreciated. New and young vegans often don’t know how to respond to common objections so wonderful responses to these objections are included. The book is packed full of citations and reveals a strong appreciation for science. I greatly valued the way in which the definition of veganism was illuminated with avenues for how to best protect it. Also, the book does a great job teaching the importance of assertive communication and how we can protect ourselves from the resistance to veganism from family, friends, and society at large. It delves into how to deal with anger we might feel living vegan in such a violent, nonvegan world and how to make sense of it all. Mr. Taft also cautions against misanthropic thinking and provides great insight into how to effectively advocate for the earthlings with whom we share this planet. I really liked the way Mr. Taft broached the discussion of veganism and masculinity. On a very practical level, the book also includes shopping suggestions. I would recommend this book to anyone, not just youth, because it provides insights for how other people might be experiencing their vegan life differently from us.